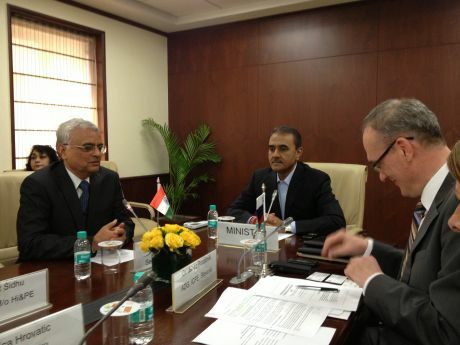 On 19 December 2013, Janez Podobnik, the Acting Director General of the International Center for Promotion of Enterprises (ICPE), signed three memoranda of understanding with Indian academic institutes in New Delhi, India, with the heads of these Institutes in the presence of Shri Praful Patel, Minister of Heavy Industries and Public Enterprises and O. P. Rawat, Secretary in the Department of Public Enterprises (DPE), currently the ex-officio President of the ICPE Council. The memoranda of understanding signed by ADG Janez Podobnik and Dr. S. K. Rao, Director General of the Administrative Staff College of India, Hyderabad, Dr. T. Chatterjee, Director of the Indian Institute of Public Administration, New Delhi and Dr. Pritam Singh, Director General of the International Management Institute, New Delhi, aim to strengthen the academic / research ties between ICPE and these reputed Indian institutes. 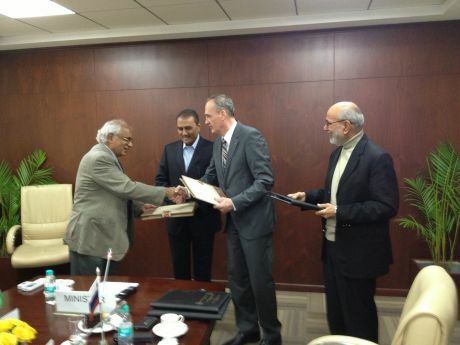 More precisely, through these agreements new avenues of cooperation will be open among ICPE and the Indian partner institutions in order to promote faculty development, research, consultancy training and improve the educational environment of the parties through advanced educational programmes, joint conferences, seminars, workshops etc. The heads of all three institutes stressed their intention to implement short and long-term courses as well as research programmes together with ICPE.